If you love to bake like I do, head to the closest bookstore. The lineup of stellar books this winter is so long I don’t know where to start. Here is just a small sample: from much loved colleague Dorie Greenspan comes Dorie’s Cookies; brilliant pastry chef Malika Ameen shows us how immensely creative she is in Sweet, Sugar, Sultry, Spice; and German-based blogger and friend Luisa Weiss’s Classic German Baking book is fast becoming a classic. 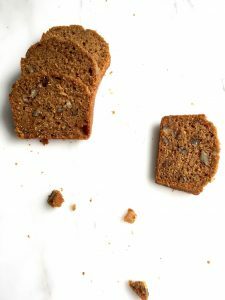 I also enjoyed Naturally Sweet from America’s Test Kitchen because it offers great tips on how to reduce sugar in baked goods without wreaking havoc. Last but not least, How to Make Sourdough by Emmanuel Hadjiandreou is splendid beyond words with recipes for sourdough brioche, panettone, challah, croissants, and of course bread. Run, go, and get these books for yourself and the bakers you love! I picked Sarah Kieffer’s new book for a rare blog post because she has emerged as such an incredibly talented baker and equally splendid photographer. You can’t help but salivate over this stunning first book of hers, the Vanilla Bean Baking Book. 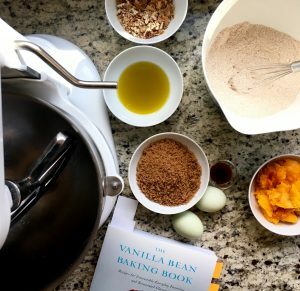 Her beautifully photographed instructions are terrific for anyone wanting to improve their baking skills, and needing inspiration to try something new. —Can I make it 100% whole grain? Yes, you can! And it was happily eaten by everyone I shared it with. Of course, as many of you know, I never say anything about the healthy whole grain part. I just say try this! —Can I use less sugar? Yes, you can! The natural sweetness of whole grain flours, even more so when they are freshly milled like mine, reduces the need for sugar. As a result, I always cut back on sugar without anyone actually missing anything. Relatedly, I have been bombarded with questions about fresh milling. I will weigh in on this soon. Promised. —Last but not least, can I make this for a small household? Of course you can! I love that Sarah adds grams in all her recipes, in addition to cup measures, because this makes cutting a recipe in half a snap. So that is what I did here. Also, I baked three mini loaves because it’s the holidays. Eat one and gift two. Win win win. This is so easy-peasy to put together that you will want to make it at once. Now just wait for the scent of the baking to drive you out of your mind! °For best outcome, be sure to use the weight measures in brackets. 1 Place an oven rack in the center and preheat to 350°F. 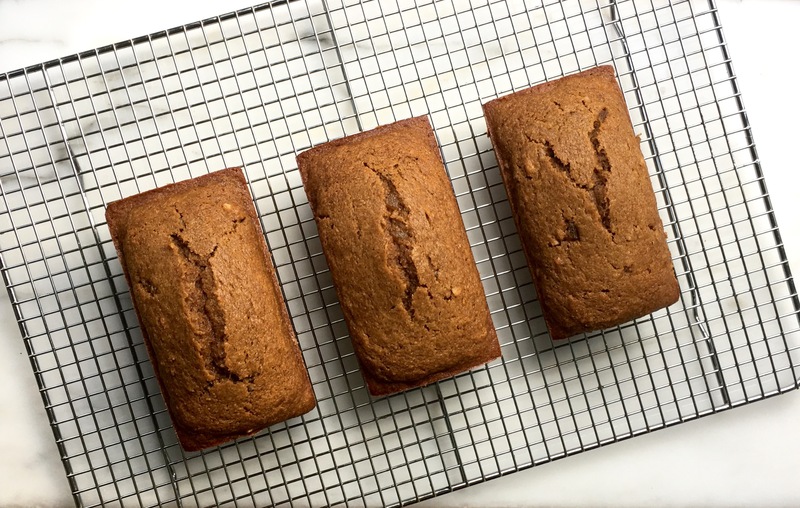 Lightly butter a 8 by 4-inch loaf pan or three mini-loaf pans with 2-1/4-cup volume each; sprinkle a bit of flour across the bottom, shaking and tapping out any excess. 2 In a medium bowl, whisk the flour, cinnamon, ginger, nutmeg, baking soda, and salt. Set aside. 3 In the bowl of a stand mixer fitted with a paddle, beat the eggs on medium high until very foamy and doubled in size, 2 to 3 minutes. Add the brown sugar, and beat on medium for two minutes. Scrape down the sides of the bowl. Add the olive oil, melted butter, vanilla, and pumpkin, and mix together on low speed until incorporated. Scrape down the sides again, and add the flour mixture in three additions, alternating with the buttermilk and starting and ending with flour. Add the pecans and mix on low until just combined. 4 Divide the batter equally among the prepared pans and bake 50-60 minutes for a single loaf, or 35 to 40 minutes for mini-loaves, until a wooden skewer or toothpick inserted in the center comes out clean. If at any point the tops are browning too quickly, lay a piece of aluminum foil over them. 5 Transfer the pan (s) to a wire rack, and allow the bread (s) to cool in the pans for about 10 minutes. Loosen all around with a small thin-bladed knife and remove the bread (s); return to the wire rack to finish cooling. Adapted and reprinted with permission from The Vanilla Bean Baking Book by Sarah Kieffer, copyright (c) 2016. Published by Avery, an imprint of Penguin Random House, New York.